gambling arraignment -- Signal Hill. 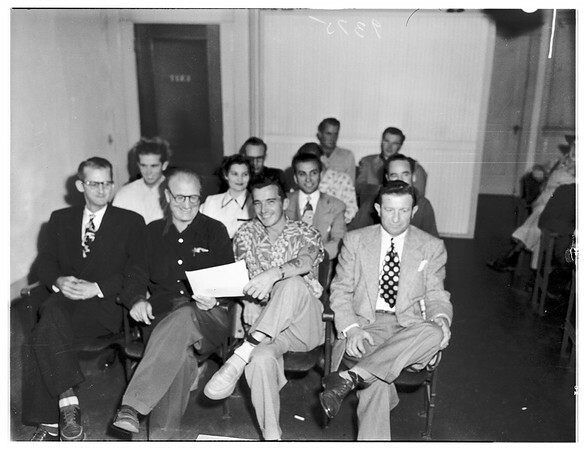 Left to right front row: Marvin Knutson, Todd Faulkner, Barney McCormick, Spencer S. Ore. Second row left to right: Don Caplinger, Ruby Lykins, Herbert Lykins, Earl Caplinger. Third row: Wanda Fisher, Paul Reber and Harley Faulkner. Fourth row: Bill Haws and Robert Ames. 2 negs. Left to right: Mrs. Ruby J. Lykins, Harley M. Faulkner, and Todd "Kid Mexico" Faulkner. Bulb failure on 4 negs".